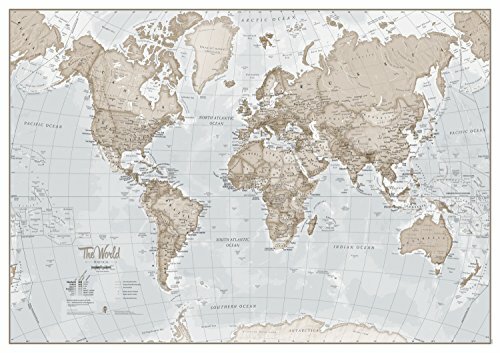 Mindful of both accuracy and style, this map of the world wall art print features soft, muted vintage tones to complement the color schemes in your home or office, and the wall world map also includes big world map developments such as the new country of South Sudan and the new international dateline. Designed to impress, the large world map poster details major towns and cities and also contains hill and sea shading. The map of the world is printed onto premium silk art paper, and the world map print is a superior color reproduction finish with high photo quality results. The wall world map measures 33 x 23 inches, and the frame is not included. Your large world map print is supplied in secure, protective packaging, rolled in a tube for crease free delivery and immediate display. NEUTRAL WORLD MAP: With soft, muted colors to complement your home décor and up to date cartography, this large map of the world will be a focal point in your home. POLITICAL MAP: Measuring 33 x 23 inches, the beautifully styled world wall map details country boundaries and cities with hill and sea shading. HIGH QUALITY PRINT: A perfect piece of wall art - world map is finished on premium silk art paper, making it an ideal world map print for keeping or gifting. CREASE-FREE DELIVERY: Your political map of the world is rolled in a tube for delivery, so it arrives ready to display.